Pet Emergency? Call us right away at (248) 486-5600! Welcome to Lyon Veterinary Clinic. We are a full service veterinary facility for small animals, including exotic pets, and provide ambulatory and 24-hour emergency services for horses. We have been providing quality veterinary services in this area since 1996. We are located on Pontiac Trail between 8 and 9 Mile Road, just North of Kroger. All of our doctors strive to provide the highest standard of medical care to our patients. They regularly attend continuing education events to bring you the latest information to help in the care of your pet. We continue to improve our technology and medical capabilities having added digital radiology services, laser technology for less painful surgical procedures and improved pain control in many injuries for our small animal patients and up to date in-house laboratory machinery for rapid patient diagnosis. We also have access to advanced laboratory services through the many outside laboratories that we use, and have been awarded the People’s Choice Award for Veterinary Care multiple times in the past several years, including for 2016. 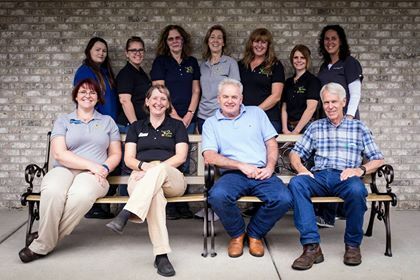 At Lyon Veterinary Clinic, we treat your pets like the valued family members they are. Dr. Heather Ferguson has been practicing small animal medicine since graduating from Michigan State University in 1990. She left work at the Michigan Humane Society to help start this practice where she takes an interest in behavioral medicine as well as surgery. Her hobbies include walking her two dogs, reading and actively training her horses for equine dressage. Dr. Erin Henderson joined our team in 2007 after working in Clinton Township. She graduated from Michigan State University in 2006 and has special interests in internal medicine, cytology and upper airway surgery. She enjoys her busy house with her husband Eric, their four sons, and dogs Goldie and Bennet. Dr. Doug Engers has been practicing equine medicine in this area for 39 years, having graduated from Michigan State University in 1970. His special interests are in herd health and reproductive medicine. He has three adult children and enjoys hunting and many other sports. Dr. Kim Miller joined the equine veterinary team in 2017 after practicing on the west side of Michigan. She graduated from St. George's University in 2014, and completed her clinical rotations at The Ohio State University. She completed her post-graduate equine sports medicine internship at Hagyard Equine Medical Institute in Lexington, Kentucky. "Fast and so friendly to both 2 legged and 4 legged friends." "I highly recommend this clinic to anyone who owns and loves animals, big and small. The staff and doctors have so much compassion and knowledge for your animal. Priced very well and the greatest care for your beloved "family member!""